Active Physiotherapy in Calgary, provides these main types of services (links above) that will treat all types of injuries and/or physical conditions. Physiotherapy refers to the application of professional physical therapy knowledge in the assessment and treatment of the human body in order to obtain, regain and maintain optimal function by the use of any suitable medium of therapeutic exercise, massage, mobilizations and/or manipulations and therapeutic modalities. Physiotherapists are educated at a University level and each province has a regulatory body to govern their practice and promote the highest standards of care for the public. Manual Therapy in Calgary: A hands on approach to normalize soft tissues including joints, muscles, ligaments, tendons and the nervous system. Therapeutic Exercises: To improve and promote strength, endurance, balance, mobility, function and fitness. Electrotherapeutic Modalities: Application of heat, ice and various machines to improve pain and inflammation. Education in Calgary: Includes information specific to the individual to assist in recovery and for prevention. At Active Physiotherapy, acupuncture is used to promote healing naturally, to decrease or alleviate pain and to improve function at the affected areas of the body. It is a safe and effective therapeutic method to use as an alternative to medications, some surgeries and as an adjunct to physiotherapy. Very fine needles are inserted through the skin and tissues at specific points on the body which cause a mild amount of discomfort. Here at Active Physiotherapy in Calgary, acupuncture can be classified into two categories, namely classical and anatomical. Classical acupuncture originated in China as one component of Traditional Chinese Medicine to assist in diagnosing and treating pain and disease. The goal behind acupuncture is to balance energy and blood in the body to promote good health and function. Anatomical acupuncture in Calgary arose due to the interest from Western health practitioners and scientists who recognized the centuries of success achieved with classical acupuncture. The knowledge of acupuncture points is used in combination with anatomy, physiology and pathophysiology by physiotherapists and doctors to effectively treat a wide variety of injuries and conditions. Thorough assessments are performed prior to treatment to determine a diagnosis in order for a qualified practitioner, such as physiotherapists and doctors, to choose appropriate acupuncture points to treat with. How does acupuncture work at Active Physiotherapy in Calgary? The insertion of acupuncture needles in the body at specific acupuncture points causes the release of the body's own pain relieving chemicals known as endorphins. The end results of pain relief, general relaxation and biochemical restoration of the body's own internal regulation system are achieved as endorphins block the passage of pain messages to the brain. An overall improvement in energy, physical and emotional well-being, biochemical balance and reduction in inflammation occur after acupuncture as the body's natural healing abilities are stimulated. What does acupuncture at Active Physiotherapy treat? When qualified and certified practitioners perform acupuncture in Calgary there are almost no adverse effects or complications associated with it. Many patients describe it as relaxing and mildly uncomfortable. Individuals with pacemakers considering acupuncture need approval from their cardiologists. Practitioners use specific precautions and contraindications with pregnant women. 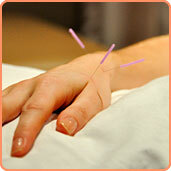 At Active Physiotherapy in Calgary, we use only sterile, disposable needles in the application of acupuncture. Individuals experience different sensations during the course of acupuncture in Calgary. There may be a mild sensation as the very fine stainless steel needle passes through the surface of the skin. Once the needle is in place a warming or flushing sensation is common. The number of treatments do vary with each individual due to numerous factors, however a general rule of thumb exists for acute versus chronic and/or complex disorders. One to a few sessions can be sufficient with acute problems. Chronic and complex conditions may require 1-2 sessions per week over several weeks wherein treatment frequency is decreased as improvements occur. At Active Physiotherapy in Calgary, acupuncture sessions are 30 minutes long but may be combined with other physiotherapy methods making the overall treatment time longer. For more information go to Acupuncture Foundation of Canada Institute. Massage therapy in Calgary can be described as the manipulation of the body's soft tissues with specific techniques to promote or restore health. Massage techniques incorporate rhythmically applied manual pressure and movement that affect the body as a whole by stimulating blood flow, lymph flow and nerve receptors. The result is an improved healing process by stimulating the lymphatic system which helps your body remove waste, by increasing blood flow which increases cell turnover and stimulating nerve receptors which innervate the body's functions. The first appointment includes your massage assessment and treatment. Your massage therapist will guide you through a series of questions regarding, your current physical condition, medical history, lifestyle, stress level, painful areas and health goals. It is best not to have eaten just before a session. Feel free to openly communicate with your massage therapist, asking any questions prior to or during the session. Communicate feedback about your needs and what you do or do not like, more or less pressure, the need for additional blankets, etc. Make yourself comfortable throughout the session so you can relax and enjoy. Your massage therapist in Calgary can answer any other questions you may have.